Depending on household income levels, you may be eligible for federal subsidies that immediately reduce your monthly health insurance premiums. The Federal subsidies are Advance Premium Tax Credits and are NOT available to people eligible for Medicaid or Medicare or who have affordable coverage through an employer. The Advance Premium Tax Credits are based on (1) the size of your household and (2) your household’s estimated income. Household income includes the household income of the taxpayer & spouse, and dependents if the dependents earned enough to file a tax return. Married couples MUST file jointly in order to get a Advance Premium Tax Credit. DO Include: Wages, Salaries & Tips, Net income from self-employment or business, Unemployment compensation, Alimony, Social Security payments, including disability payments, Income from investments, retirement, pensions & rental income, Other taxable income such as prizes, awards, and gambling winnings. Keep in mind that federal subsidies are Advance Premium Tax Credits based upon your household’s Modified Adjusted Gross Income. The tax credits will be reconciled when you file your federal income taxes, so try to be as accurate as possible. Significant mid-year changes in income should be reported to the exchange’s customer service department. Using the chart below of the 2019 Federal Poverty Levels, depending on the number of people in your household from Step 1 and the estimated household income from Step 2, if the number falls between 134% and 400% of the Federal Poverty Level, you may be eligible for a Advance Premium Tax Credit. 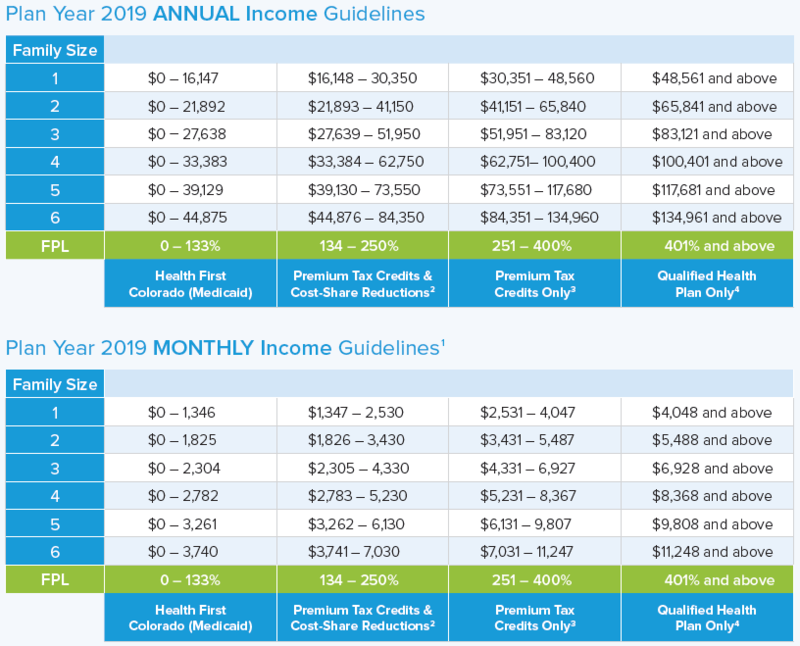 If you make 0 to 133% of the of federal poverty level, you should be eligible for Health First Colorado (Medicaid) and are not eligible for federal tax credits on private insurance. Health First Colorado uses Monthly Income to determine eligibility. 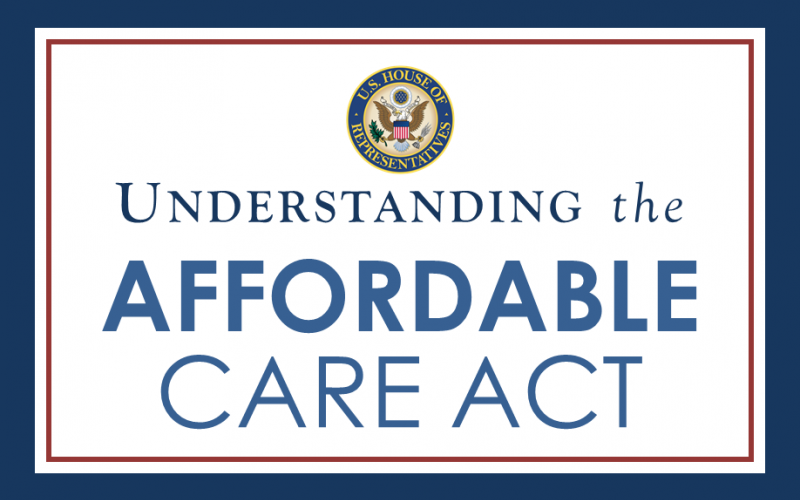 People with income between 134 and 250% may qualify for Cost Sharing Reductions (CSR) that have lower deductibles & out of pocket costs in addition to Advance Premium Tax Credits (APTC). Advance Premium Tax Credits (APTC) may be available to people with household income between 134% and 400% of federal poverty level. However, the higher your income, the lower the Advance Premium Tax Credit and not all people near the upper end of the scale will qualify for a tax credit, particularly if they are younger. If you make 401% or more, you’re not eligible for an Advance Premium Tax Credit, but can still purchase a Qualified Health Plan (QHP), which is simply an Affordable Care Act compliant health insurance plan. Advance Premium Tax Credits are not available to people eligible for Medicaid or Medicare or who have affordable coverage through an employer. You can also use the subsidy calculator to give you a rough estimate.